Until this past weekend, I would never have associated the Easter holiday with the strange and surreal. But if it keeps up the same pattern as last weekend, Halloween will be hard pressed to remain my favorite holiday. Friday morning, I was driving on the Bourbon County side of Headquarters Road. It was obvious even then that the rain was going to cause flash flooding at least. Water was already standing inches deep in pools along the roadsides and the natural drainage off the hillsides resembled nothing less than old creek beds. In the meantime, I was getting thoroughly irritated by the two-ton truck tailgating me because, apparently, I wasn’t driving fast enough through deep, standing waters. 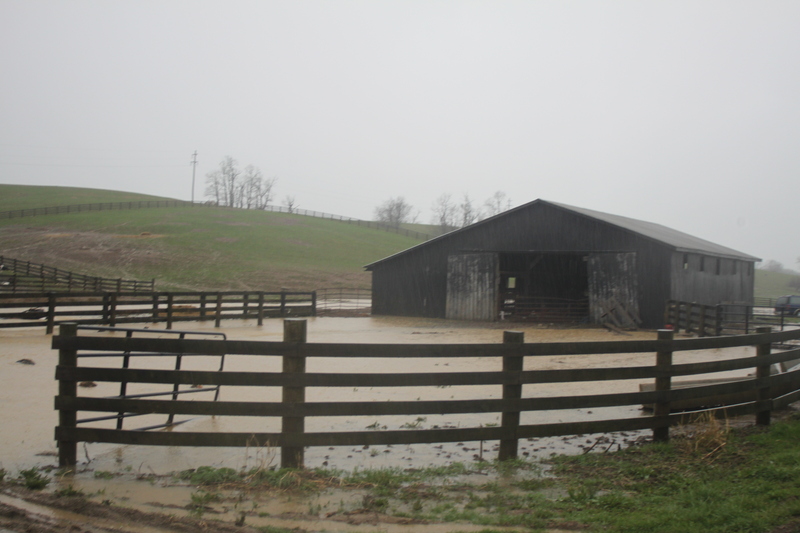 Thinking it would be a good idea to get some pictures for this week’s paper, I saw a potential image of creek water running through a barn along the side of the road. Though it was at the height of the pouring rain, I pulled into a nearby driveway, grabbed my camera and went to the side of the road. I noticed the Nicholas County school bus coming down the road. It’s the one that transports students to the Harrison Area Technology Center every morning. I did not notice the pool — NOTE: not a puddle! — of water right in front of me. The school bus’ front tire sent a tsunami shooting high above my head. It was like standing in front of a firing squad. I saw the wall of water coming and there was nothing I could do except take it, shrug, and get my picture. 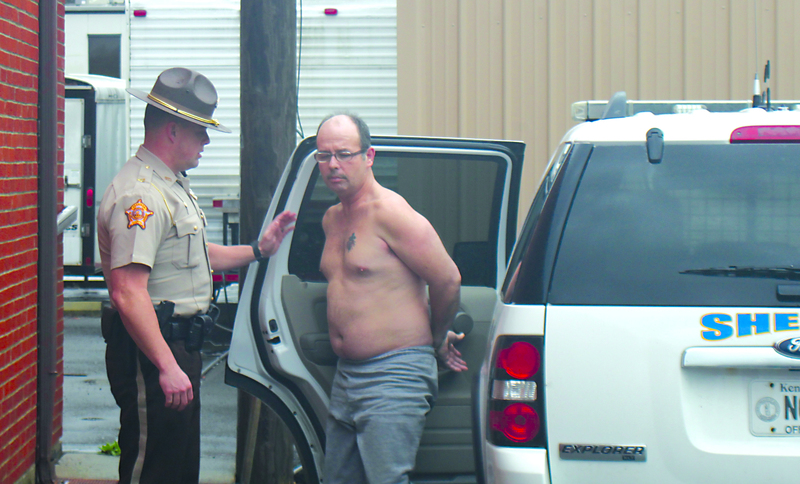 Later on, as I’m drying off while covering heroin arrests at the Sheriff’s department, I listened with bemusement to a phone exchange between Sheriff Shain Stephens and family members of an accused drug trafficker who were apparently attempting to dictate the terms of their son’s surrender…. “The intersection to Shadynook Road? No? Oh, you want me to come down Shadynook a few miles. ….. Alone. … No other cops……. Listening to that negotiation go its expected direction — Nowhere — I forgot all about my experience with the roadside tsunami until Saturday morning at The Frankie Taylor Community Easter Egg Hunt at Ingles Field. One thing I have learned about kids — when they’re excited about an event, like, say, an Easter egg hunt, they’re as coiled to spring as an Olympic sprinter in the starting block. 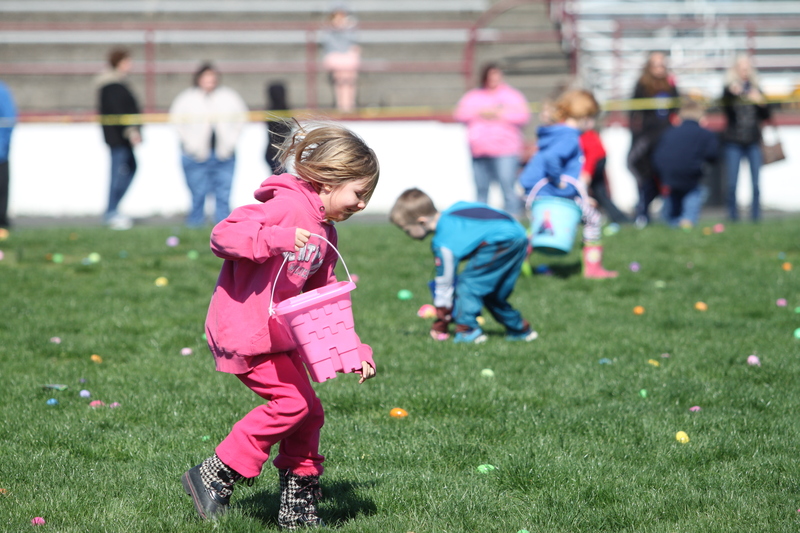 Despite being an un-spring-like morning with slightly frigid temperatures, the intense anticipation of hundreds of children surrounding the different Easter egg hunt fields at the stadium generated its own kind of heat. By 11 a.m., the scheduled start time for the hunt, the kids were looking for any sign, any excuse, to pounce on those eggs. I saw Leroy Conner walking out to the center of the field with every good intention of arranging an exciting, but orderly, start to the Easter egg hunt. Lacking a sound system or a bullhorn, Conner raised his arm for attention and that was enough to prove a basic law of physics: Kinetic energy, once released, cannot be stopped. Once the first few kids launched themselves into the field, the only thing Mr. Conner could do was stand still and let the inevitable tide of children run by him. I understood a little about how he felt. But let me tell you, the Kentucky Derby bills itself as the fastest two minutes in sports. Pah! I say. The Derby has nothing on the Frankie Taylor Easter Egg Hunt. That field of 10,000 eggs was picked clean in less than 60 seconds. If only there was a way to apply this method to cleaning their room, I heard more than one parent say. 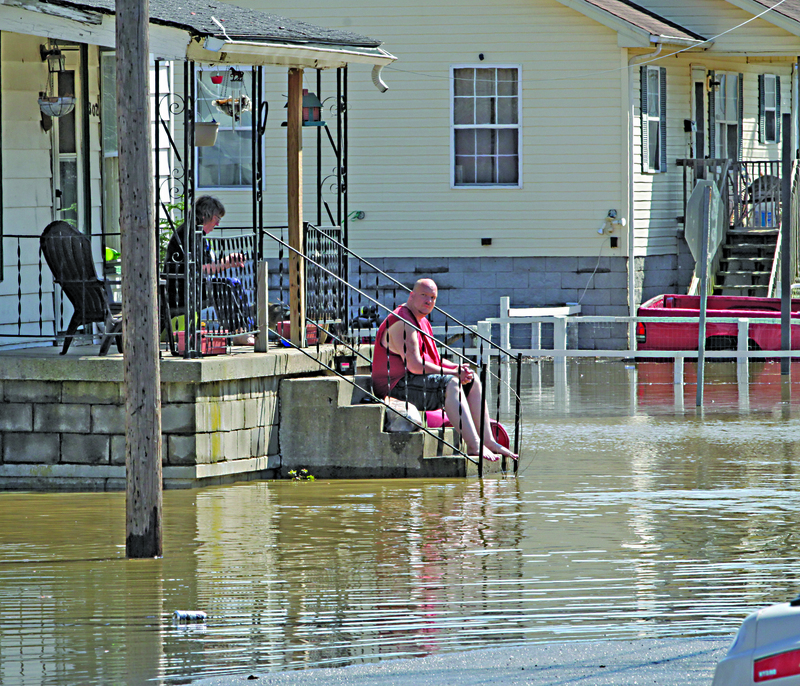 Afterward, on what became a cloudless and warm spring day with deep blue skies, I took pictures of rising flood waters in the west end of town. After all that, the spectacle of Kentucky losing to Wisconsin, painful as it was, barely registered as a footnote for such a strange series of Easter weekend events.